An online solid-phase extraction and liquid chromatography in combination with tandem mass spectrometry method was developed for the simultaneous determination of 31 antibiotics in drinking water, surface water and reclaimed waters. The developed methodology requires small sample volume (10 mL), very little sample preparation and total sample run time was 20 min. An Ion Max API heated electrospray ionization source operated in the positive mode with two selected reaction monitoring transitions was used per antibiotic for positive identity and quantification performed by the internal standard approach, to correct for matrix effects and any losses in the online extraction step. Method detection limits were in the range of 1.2–9.7, 2.2–15, 5.5–63 ng/L in drinking water, surface water and reclaimed waters, respectively. The method accuracy in matrix spiked samples ranged from 50–150 % for the studied antibiotics. The applicability of the method was demonstrated using various environmental and reclaimed water matrices. Erythromycin was detected in more than 85 % of the samples in all matrices (28–414, n.d.–199, n.d.–66 ng/L in reclaimed, river and drinking waters respectively). The other frequently detected antibiotics in reclaimed waters were nalidixic acid, clarithromycin, azithromycin, trimethoprim, and sulfamethoxazole. 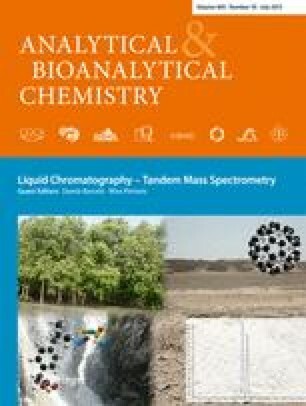 Published in the special paper collection Liquid Chromatography—Tandem Mass Spectrometry with guest editors Damià Barceló and Mira Petrovic. The online version of this article (doi: 10.1007/s00216-013-6863-8) contains supplementary material, which is available to authorized users. The Environmental Analysis Research Laboratory acknowledges the support from the Thermo Scientific Corporation in the development of this work. Sudha Rani Batchu would like to thank Florida International University graduate school for supporting her through Doctoral Evidence Acquisition Fellowship. This is contribution number 606 from the Southeast Environmental Research Center at Florida International University.